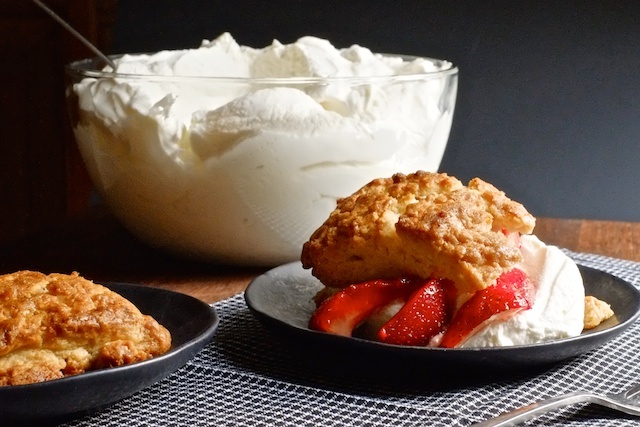 About a year ago I posted a formula for scones that could be made savory or sweet. At the time I chose to highlight the recipe’s versatility by making cheddar chive scones, but I want to remind everyone, and make sure you are all fully and viscerally aware that my old recipe works just perfectly for sweets. Plus, whenever I eat strawberry shortcake, the shortcakes are really dry and um dry. 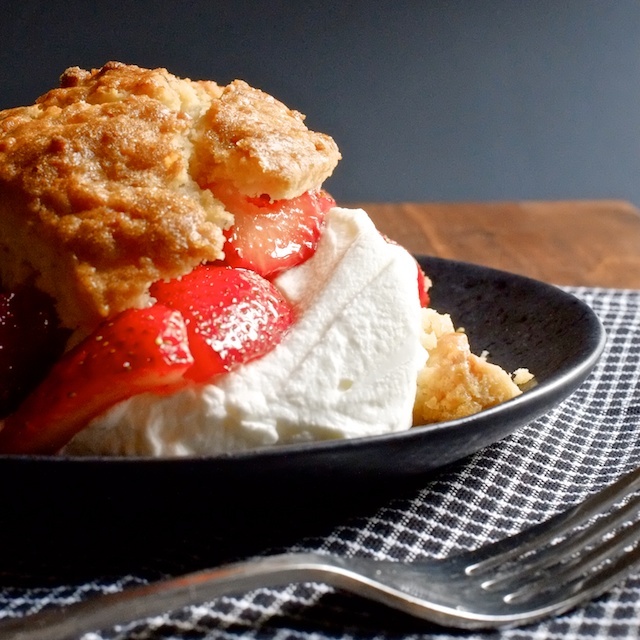 These scones are the opposite of dry because they are full of butter and cream and topped with crackly sugar and the textural contrast is just incomparable (especially fresh out of the oven…mmph). 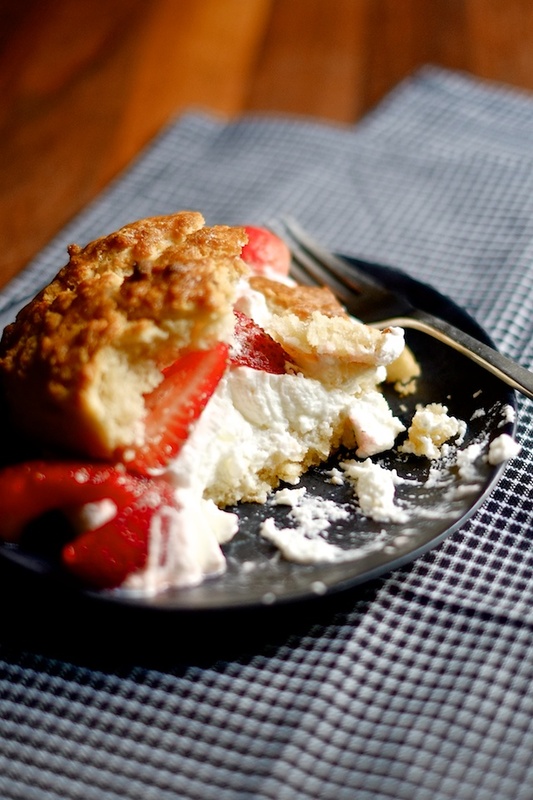 They are also simple to make and an appropriate substitute for shortcake (in my opinion) because they aren’t overly sweet. You can top them however you like, but I do recommend whipped cream and berries. It’s the right thing to do this time of year. My sister’s weasely little chihuahua, Bandit, agrees. But he’s not allowed sweets like this, so eat one for him, will you? 1. Follow instructions outlined (with illustrations) for making scone dough and baking it properly in my “last scone recipe you’ll ever need” post – the photos are really helpful in getting the texture right. For plain, sweet scones use the flour, salt, baking powder, and brown sugar for the dry ingredients, butter and cream for the wet ingredients. Cut packed/refrigerated dough disks into six even slices for larger scones (like the one pictured) or eight slices for smaller scones. Brush with cream, sprinkle with brown sugar, and bake at 400. 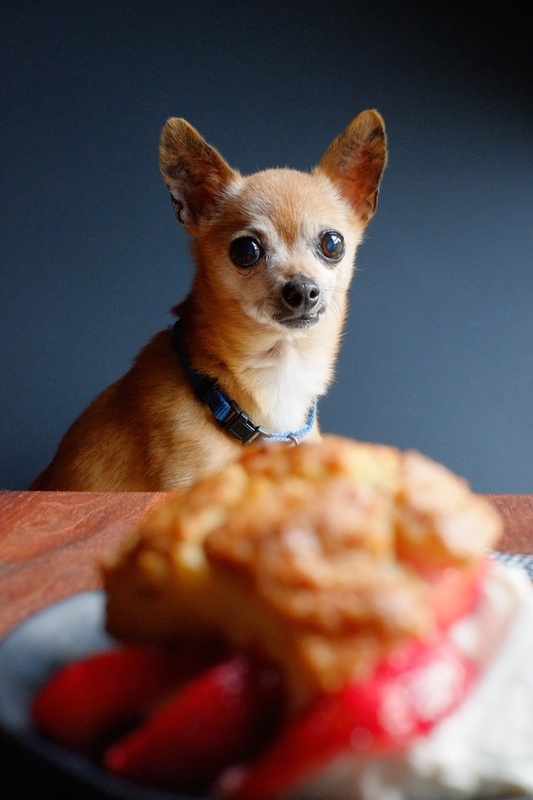 But seriously, go back and read my last scone post – you will be glad you did. 2. Wash and hull strawberries, then slice however you like. If they are a little on the tart side, sprinkle them with a teaspoon or two of sugar, stir to distribute, and set aside. 3. Pour 2-3 cups cold whipping cream into a bowl with 2-3 Tbsp granulated sugar and a tiny pinch of salt. Whip with a stand mixer or hand mixer until fluffy (I like mine a bit stiff, some people like it drapey – follow your heart or whatever, just don’t let it become butter). Taste and add more sugar if you like it extra sweet. 4. 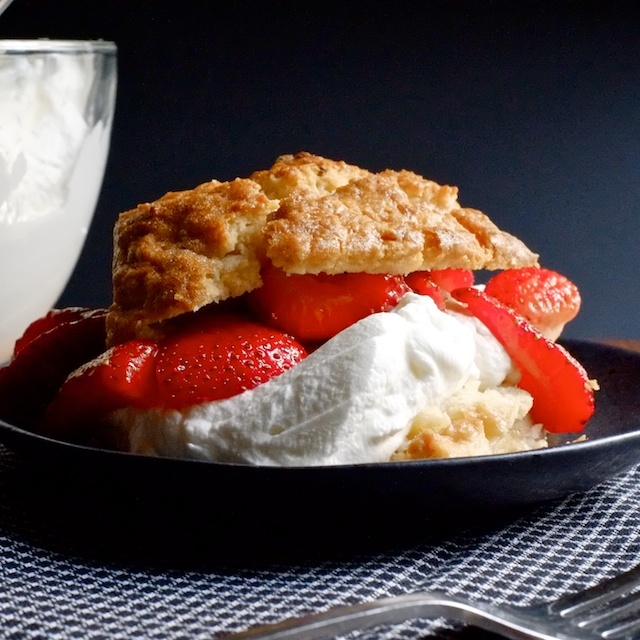 Split warm scones with a bread knife, pile with whipped cream and strawberries, and eat up. mmmmmmmmm so good, thank you! <3 I could eat these every day.